Welcome to ThreadABead's 2018 Christmas project! This year we have chosen the nativity as our project and of course when ThreadABead does a nativity, we are not just stopping at the figures! Over the course of the project you will be building up an entire nativity scene, something you can treasure and display year after year. 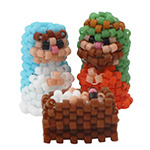 In part 1 we will be creating the two figures of Mary and Joseph along with a tiny baby Jesus in his manger. The entire project will consist of 8 parts in total covering 15 individual beaded elements. All parts do not need to be purchased in order. Please note: Although no knowledge is assumed, it is recommended that the beader does have prior experience of beading. Techniques used are Odd Count Peyote, Round Peyote with increases and decreases. As usual with ThreadABead featured patterns we give full detailed photographic instructions and in this part there are 70 detailed steps. Please note the pattern may not work with any other size and type of beads. There are 9 colours in total and the finished beadwork is approximately 3cm (w) x 2.25(d) x 2 (h) cm. Additionally, 2 x 8mm crystal ab, 2 x 6mm crystal ab and 1 x 4mm crystal ab fire polished beads are also required along with both white and gold coloured Nymo thread. A no tangle thread bobbin is useful but optional. The bead pattern supplied is 21 pages with full colour step by step photographic instructions.